Is there a connection between ancient sites and the golden mean ratio? Alexander Putney has carefully plotted several locations surrounding the Giza plateau finding a strong correlation between several sites. While mainstream archeology all but ignores these connections, they are real. What purpose could these placements have? Given that the Earth is enshrouded by scalar waves created by the inactions between the negative electric pole of the Earth and the positive pole of the atmosphere, there is a staggering correlation. It appears that the pyramids are just one part of a grand ancient series of sites spanning the globe. A perfect circle bisecting the Earth describes the alignment of sacred energetic sites: a hoop of light. To the southeast of the Sphinx, directly east of the smallest pyramid is the massive limestone wall that defines an angular alignment not observed elsewhere in the Giza complex. 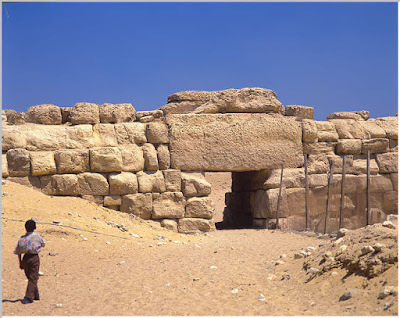 The Wall of the Crow is a 600’ long by 30’ high megalithic wall undercut by a portal with a lintel that is among the largest fitted stones on the Giza plateau. The interlocking masonry of this entrance to the plateau is highly reminiscent of the stonework found in the Andes, especially the megalithic site of Saqsaywaman, in modern day Peru at the ancient Inca capital of Cuzco. Giza’s gigantic Wall of the Crow does not share the pyramidal alignment to the geographic poles, but is angled 5° north of due east. 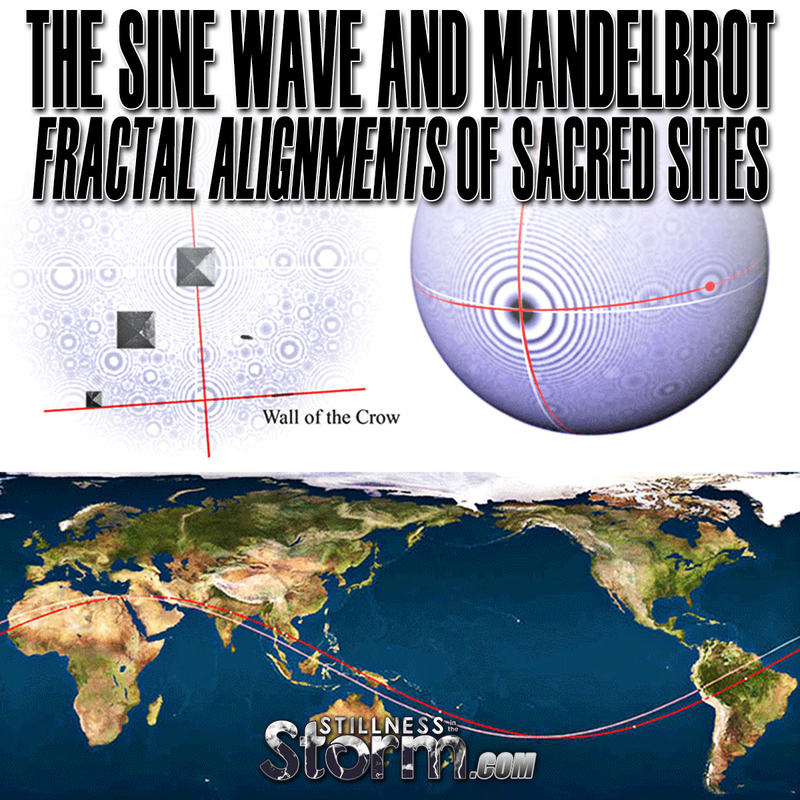 The wall defines a division of two hemispheres along a circumference line around the Earth ’as the crow flies’, passing through Giza’s antipode in the Pacific Ocean at 30°S 149°W. Along that straight line path lay the Angkor temples of Cambodia to the east and the Nazca lines of Peru to the west, an alignment described as the Sine Wave of ancient sites by Jim Alison. The Wall of the Crow begins and ends at nodal points of the Magnetic Resonance structure, revealing the intimate relationship between the invisible resonance patterns and the layout of the limestone pyramid complex at Giza. As well, its name is another psychoacoustic reference to flight and the sine wave pattern produced by the flapping of a bird’s wings, just as observed at several of the sites along its defined planetary circumference, like the Nazca hummingbird. This Sine Wave circumference is one half of a quadrupolar alignment that is offset to the same degree as the Earth’s magnetic North pole from the geographic N pole, the axis of Earth’s rotation. A line perpendicular to the Wall of the Crow, passing through the center of the Great Pyramid at an angle of 5° west of due north, describes the pyramids’ alignment to the magnetic N pole, which fluctuates position near 78.3°N 104.0°W in the Canadian arctic. The distance from the magnetic N pole to Giza in miles is identical to that of Giza to Angkor, both about 4,754 miles from Giza (F#359) along a pair of perpendicular circumferences quartering the Earth. These two intersecting circles of aligned sites define the axis of the quadrupolar standing waves described here as Magnetic Resonance. If a great circle is drawn around Giza passing through all of the points at this 19.1% distance from Giza, Angkor is exactly 25% of its circumference away from the magnetic North pole. This isosceles triangle of sites delineates the two prime meridians passing through Giza, at prime resonant distances. This analysis focuses on the straight-line phi relationships along these quadrupolar axes to reveal the nonlinear acoustic standing wave structures underlying the framework of Alison’s Sine Wave model. The golden ratio or phi is precisely expressed in the global circumference distances between Giza, Angkor and Nazca. Because of this perfect ratio any three consecutive numbers of the F series can be used to precisely describe their proportionate distances, the unit of measure itself depending on which Fibonacci triplet is chosen. The Fibonacci triplet beginning with prime F#137 accurately expresses the Sine Wave circumference distances as a percent of the whole circumference. The Fibonacci triplet beginning with the next prime in the Fseries, #359, accurately expresses the Sine Wave circumference distances in miles. This profound underlying relationship informs the application of the Mandelbrot set, which has been suspected by many as being a fundamental construct of the universe. The high degree of accuracy of these alignments forces the conclusion that ancient humanity’s capacity for aerial surveillance far exceeds that achieved today. In addition, the application of 75 digit prime numbers that coincide with the Fibonacci series clearly demonstrates the advanced state of consciousness of ancient society. This interesting relationship of Fibonacci sequence primes is presented in Appendix I, including a listing of the first 16 such numbers in the Fseries. Since the ancient origin of the mile is unknown, these newly recognized precision nonlinear alignments strongly suggest that the mile is a unit of measurement inherited from the pyramid builders themselves. This ancient application of the Fibonacci nonlinear progression of phi (1.618) to calculate infrasound resonance locations is made possible by the self-similar nature of the F series, dictating that all consecutive samplings of the sequence express identical ratios regardless of their magnitude. For this reason, any nine-digit sequence from the Fseries would accurately reflect the megalithic site distances from Giza. Apparently the mile is a unit of measurement specifically calibrated for convenient calculation of global resonance patterns through the application of Fibonacci number sequences! The mathematical constructs now attributed to Fibonacci and Mandelbrot are indeed rediscoveries of the sacred geometry, literally used to unify the consciousness of humanity in ancient times.